Turtonator in game: 2,586 Who? Important notice! Pokemon Turtonator is a fictional character of humans. Turtonator (Japanese: ????? Bakugames) is a dual-type Fire/Dragon Pokémon introduced in Generation VII. 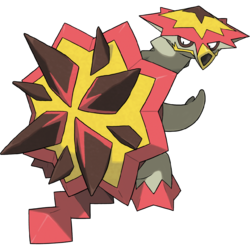 Turtonator is a bipedal, turtle-like Pokémon with a spiny shell. Its skin is a greenish-gray and only visible on its limbs, tail, head, and neck. On top of its head is an additional shell with many points around the brim. This extra shell has a black center, yellow in the middle, and a red outer rim. Its eyes have black markings around the bottom, and it has a tubular, yellow snout with a single, large nostril. Turtonator has a wide mouth, where the lower lip is marked with a jagged yellow line extending from its nose. On each side of Turtonator's long neck are two short, triangular projections. Its front legs have mitten-like hands, while its hind feet have claw-like red growths around them. Most of its tail is also covered by red plating, which has fin-like projections. The shell that encases its body has a red underside with a star-shaped, yellow-rimmed hole in the center. The back of the shell has a yellow center with several, brownish-black spikes. Four large spines with red bases form a star-shape in the center with four smaller spikes around them. This Pokémon resides on volcanoes, where it camouflages itself among the rocks and waits for prey. In addition to hunting, Turtonator also feed on sulfur and other volcanic materials. This diet rich in explosive material has contributed to a layer of explosive material in its shell. When prey steps onto its shell, it strikes itself with its own tail to cause an explosion. 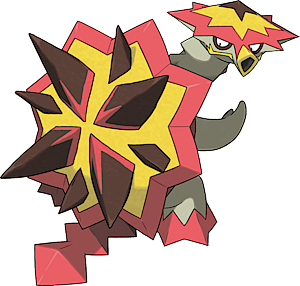 The explosion is ignited by sparks from the spikes on its shell, and released through the hole on its chest. This orifice also acts as Turtonator's weak point. Kiawe has a Turtonator that he obtained prior to Alola to New Adventure!. The shell on its back is chemically unstable and explodes violently if struck. The hole in its stomach is its weak point. It gushes fire and poisonous gases from its nostrils. Its dung is an explosive substance and can be put to various uses. Moves marked with a superscript game abbreviation can only be bred onto Turtonator in that game. Turtonator has the highest base Defense stat of all Dragon-type Pokémon. Turtonator can be seen as a counterpart to Drampa. Both are Dragon-type Pokémon with the same base stat total. They also share the same stat values, but with the exception of Speed, these values are assigned to different stats. While Turtonator is exclusive to Sun, Drampa is exclusive to Pokémon Moon. Turtonator may be based on the mata mata, a kind of turtle. It also has elements of a land mine. 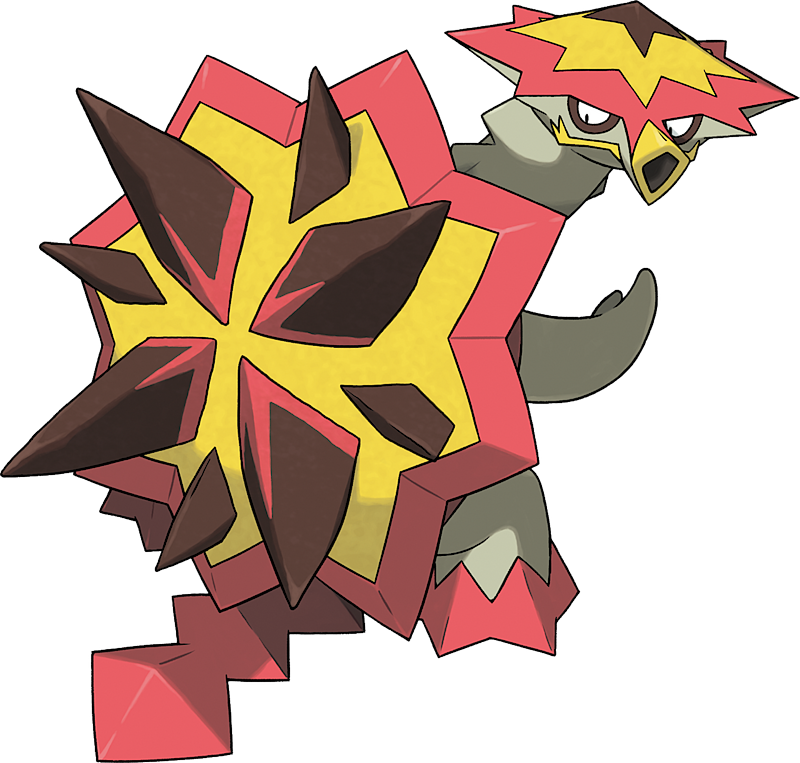 Turtonator may be a combination of turtle and detonator. Bakugames may be a combination of ?? bakuhatsu (explosion) and ? kame (turtle).